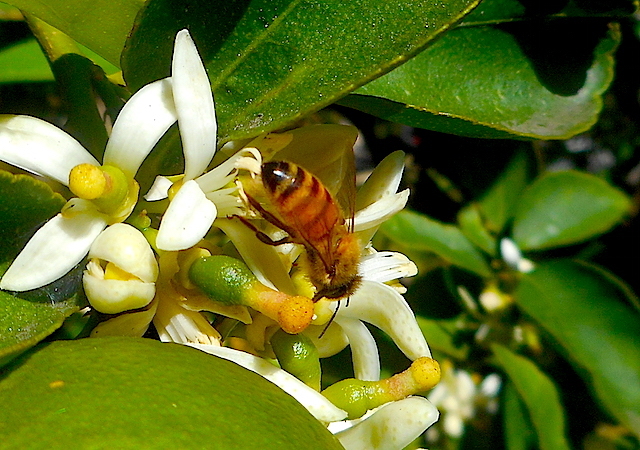 POLLINIS is concerned about the lack of regulatory studies regarding the cocktail effects of pesticides on pollinating insects. Now, a new article, just published in the journal Royal Society, reveals the devastating impact of mixtures between neonicotinoid pesticides and fungicides on solitary bees. The study - entitled Combined exposure to sublethal concentrations of an insecticide and a fungicide affecting feeding, and the development and longevity in a solitary bee conducted under the direction of Dr. Fabio Sgolastra, University of Bologna, Italy - reveals the effect synergistic between a neonicotinoid insecticide, clothianidin, and a fungicide, propiconazole. This pesticide cocktail affects fertility (delaying ovarian development) and the lifespan of solitary bees exposed to mixing, even at low doses. However, current legislation does not require testing of pesticide mixtures prior to authorization. Plant protection products are studied individually but never in combination. However, in the field, pollinating insects are well exposed to pesticide mixtures, not to a particular product. That's the whole system of risk assessment and pesticide registration that needs to be reviewed. This study shows the devastating impact of pesticides on wild bees. However, the current tests only concern honeybees. POLLINIS therefore requests tests on several species of pollinating insects and not only on honeybees, which can not be representative of all pollinating species. Capilano strongly denied any issues with its products and criticised the type of test — known as Nuclear Magnetic Resonance (NMR) — used to detect the impurities, pointing out that it differed from the official Australian test. There is no suggestion that Capilano's eponymous brand of Australian-sourced honey has any issue or that Capilano or other brands were aware of the adulteration. Phil McCabe, the president of the International Federation of Beekeepers' Association (Apimondia), believes the NMR test is the most accurate available and thinks consumers are not getting what they paid for. "Adulterated honey isn't honey at all," he told 7.30. During the night of September 14 to 15, The "Macron" deputies refused to include a law banning the controversial glyphosate herbicide. The political reaction on the left heavily criticised the "macronites" on this issue. The debate was long and heated inside the French National Assembly to once more discuss a draft law on agriculture and food. It was only in the early morning that the deputies, mostly from The Republic on the Move (LREM — Macronites), decided to reject all the amendments that included clauses for the president to commit to ban glyphosate, the controversial herbicide, "At the latest within three years". In May, during the first reading of the text, parliamentarians, including some protesters, had already pleaded unsuccessfully to secure a ban on glyphosate, in law. They did not have the support of former Minister of Ecological Transition, Nicolas Hulot, either. This spring, the Minister of Agriculture Stéphane Travert opposed, during the new debate on this subject, anti-glyphosate amendments. He wished to put forward "his own method" to ban it within three years: "Empowerment of actors (manufacturers and users) plus research on alternative solutions rather than prohibition by law." Be sarcastic... Read from top. Stéphane Travert's "idea" will not work and he knows it. Locals said they were concerned the bees may have been poisoned, as they say a council worker from the District Council of Peterborough spraying weed killer. "It's a possibility someone might have poisoned them," Ms Reid said. She said she had been in touch with the Department of Primary Industries and Regions (PIRSA) about the situation. "The guy that I spoke to said that he wants members of the community to get containers and fill them with bees," Ms Reid said. Jason O'Connell, a Peterborough local of 13 years, said he had never seen anything like this before. "At the moment, you might sit out there and there might be a dozen or two dozen bees instead of the normal two hundred bees out in the yard," Mr O'Connell said. "It could be due to the council having sprayed weeds recently, especially since now the weeds are flowering. "If they're spraying them the bees get a direct dose of [weedkiller], or it could be colony collapse." A study published in the journal Science found bees exposed to an insecticide called imidacloprid were less likely to feed and care for their larvae, and spent more time hanging out around the edges of the nest. According to study lead author and Harvard University biologist James Crall, the most surprising and puzzling finding was that the effect on bee behaviour was strongest at night. "If you look overnight, it's totally striking," Dr Crall said. "Oftentimes the majority or all of a colony [affected by imidaclorprid] will be immobile — which you never see in healthy colonies. "That means less nursing overnight." Imidacloprid belongs to a class of insecticides called neonicotinoids (also called "neonics", which is a lot easier to say). Chemically similar to nicotine, these are highly effective insecticides that interfere with an insect's nervous system. There has been an ongoing and bitter dispute over the evidence that neonic use affects bees badly in the field. This year the European Union announced it would ban the outdoor use of three insecticides in this class, including imidacloprid. For their study, Dr Crall and team filmed the behaviour of 12 colonies of the Bombus impatiens species of bumblebee in the lab, each for five minutes, 12 times a day for two weeks. Translated from French by Jules Letambour. The world today is facing tremendous changes in agriculture and food. Natural phenomena and human activity weaken ecosystems and threaten certain animal and plant species that are essential for the survival of our species. The excess mortality of bees must be a wake-up call for all of us. As rightly said Martin Gray, who lived a large part of his life on the hills of Cannes, in his book entitled In the name of all men. Abel and Cain (Editions du Rocher, 2004): "And one day the bees will die. And honey, that old friend of Abel, will disappear. It will be the announcement of the end of the human history of men. This pollinator is a major player in the environment and agriculture and its conservation must be a national goal. The winter of 2017-2018 saw a significant collapse in the number of bees in France. The survey conducted by the Ministry of Agriculture and Food reported a colony mortality rate of almost 30%, which is a disastrous figure. It's not just a local problem. Since the late 1990s, beekeepers around the world have been trying to alert the authorities to the risks associated with the disappearance of this vital link in the food chain. Since then, they have noticed an unusual decline in colonies. We have all been aware of the role of bees in the ecosystem. They are not only important because they produce honey, they play a major role in the production of our food. They promote not only the pollination of wild plants but also cultivated. A third of our food crops are pollinated by insects. Without their intervention, our agricultural productivity would be well diminished and up to 75% of our crops would suffer a decline in yield. Of the 100 plant species that provide 90% of the world's food, 71 depend on bees and their pollination. In Europe, 4,000 varieties of vegetables grown, as well as certain forage plants indispensable to livestock, would not exist without the labor of bees. In France, honey production increased from 35,000 tonnes in the mid-1990s to 9,000 tonnes in 2016, a drop of three-quarters of production. Global warming (aka "climate change") is stressing habitats. Add insecticides, viruses, herbicides and other poisons to the mix — and a catastrophe becomes a ten-fold reality. Succinate dehydrogenase inhibitors (SDHIs) are now widely used worldwide as fungicides to limit the proliferation of molds in cereal crops, or to better preserve fruits, vegetables, and seeds from these molds, as well as to facilitate the lawn care for public spaces and golf courses. According to the companies that produce them, the SDHIs quite specifically inhibit the activity of the succinate dehydrogenase in the molds. We here establish that these inhibitors readily inhibit the earthworm and the human enzyme, raising a new concern on the danger of their large scale utilization in agriculture. This is all the more worrying as we know that the loss of function, partial or total, of the SDH activity caused by genetic variants causes severe human neurological diseases, or leads to the development of tumors and/or cancers. Note this article has not been peer reviewed but other sources strongly coalesce. Read from top. Translation not available. Jules (Letambour) is not contactable.